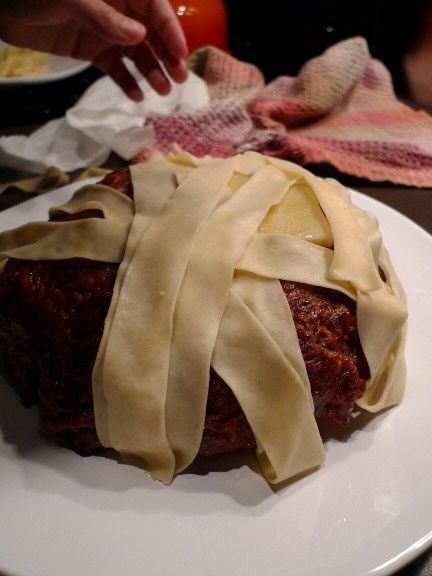 I was looking on epicurious for a recipe when I came across Yummy Mummy Meatloaf. How funny! This was so not the recipe I was searching for but it made me laugh, I got completely sidetracked and decided I had to make it! As it turns out there are a few different variations of this ghoulish dinner idea floating around in cyberspace. It all comes down to meatloaf, pasta, cheese and olives. If you like all of those things, you'll enjoy this dish and it's sure to impress any little ones you have in the house! Meatloaf. I just used my mom's recipe with a few additions. There was never a whole lot of actual measuring. It makes for a moist loaf that always tastes great. If it is too wet add a little more breadcrumbs. shape the mixture into a round mound! I did try the glaze from Matthew Mead's recipe (from the Yummy Mummy Meatloaf link above) and it was a nice addition. Mix together and spread over the meatloaf. Bake for 1 hour or until done. Let rest. I used pappardelle. Make according to the package. Some variations used lasagna and cut off the frilly ends. Both work. Drain it and separate so the pieces do not stick together. Keep warm while meatloaf is resting. Put your meatloaf on a serving tray. Put two pieces of cheese (I used cheddar, it was in the fridge) where the eyes would be and then wrap the pasta over the loaf like mummy wrappings. Add the olives for eyes. How about personal mini mummy meatloaf?! Make small mounds, use fettucine and smaller olives. I'll have to try that next year!